The 20th century witnessed the birth and amazing development of particle physics. From the pio­neer­ing discoveries of Rutherford and Thomson (the "first" particles, the proton and the electron) to the devel­opment of quantum theory (its birth intimately con­nected with the establishment of that other particle, the photon) to the boom of the 1940s and 1950s associated with the advances in nuclear physics, particle physics enters the new millenium with an impressive body of achievements: a fantastically successful theory of three of the four funda­mental interactions in nature (the electromagnetic, nuclear weak and nuclear strong "forces"), capable of making the most precise predictions known to science. The Standard Model of particle physics, developed over 30 years ago by Glashow, Salam and Weinberg accurately describes the wealth of current experimental data and has withstood the boldest challenges – experimental and otherwise – that the scientific community has come up with. 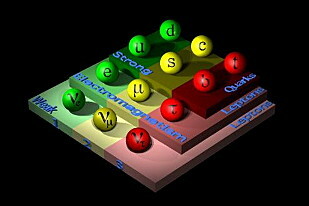 The variety of different particles is organised according to their properties and interactions, the leptons (the electron, muon and tau particles and the elusive neutrinos), the quarks (components of nuclear matter, the sixth finally discovered last decade) and the quanta of the several interactions, the photon (for the electromagnetic field), the W and Z bosons (for the nuclear weak interactions) and the eight gluons (for the nuclear strong force). Only the Higgs boson has eluded detection so far, its discovery being the main drive for the construction of the gargantuan LHC particle accelerator scheduled to start working in Geneva in the next few years. The picture, as Lord Kelvin said a century ago, seems nearly complete. And yet the consensus is that the current model is not the ultimate theory of particle physics, the recent experimental evidence for the finite mass of neutrinos (by contrast to what was believed for so long) being the strongest reason for that belief. Also, much remains to be explained in the Standard Model: why do fermionic particles occur in nature in "families", and why are there three of them? Do we truly understand the mechanism of generation of particles' masses in the Standard Model, or does that sector of the theory still hold surprises? Are the predictions of the theory solid enough to describe the data that will be produced by the next, more powerful, generations of particle accelerators? Or do new theories, like supersymmetry, need to be brought forward to expand our theoretical understanding of the world of the infinitely small? We now begin to see the first hints of new physics beyond the Standard Model, in the ever-changing landscape of the particle world. Far from complete, our current understanding of particle physics seems about to reach its limits and to be challenged by new, exciting phenomena, the description of which will require the elaboration of new models.